Here is the February 2013 "It Girl" Box I received from Julep today. I'm so excited about these colors! 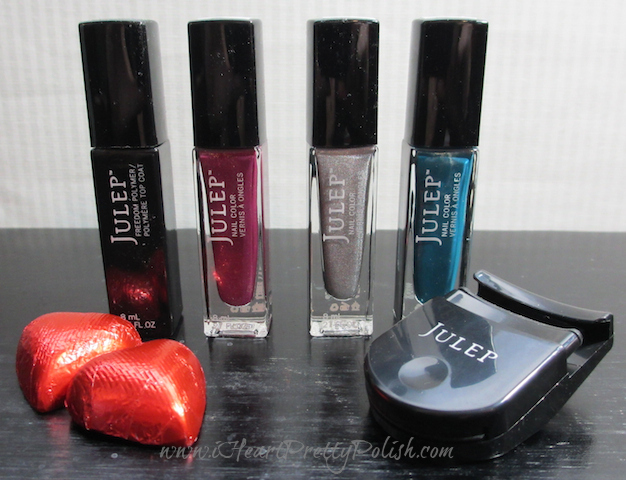 As you can see; along with the nail polish, Julep threw in an eye lash curler and some chocolates. The other item that was included in this box is the Freedom Polymer Top Coat. The box says "it goes on like a polish, performs like a gel". I have been trying some new top coats lately, so this came at a great time. 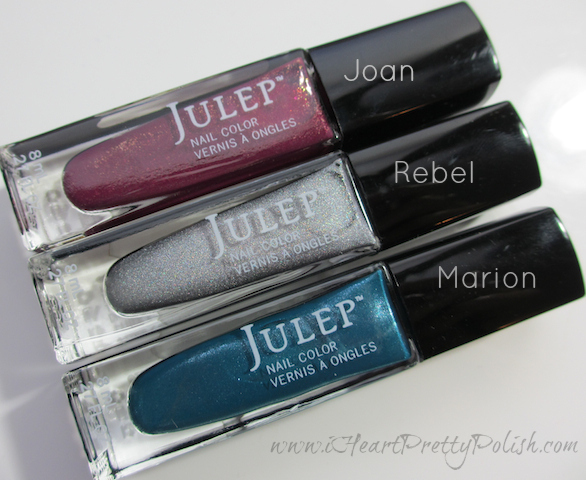 Here are the colors and the description from the Julep website. Joan is a raspberry plum with a rose gold shimmer. Rebel is a silver holographic. Marion is a smoky blue with silver shimmer. I think I may try one of these tonight. I am excited for them because I love nail polishes with the subtle shimmer like this. And this will be my second holographic polish - it will be fun to try. Did you choose a Julep box for February? If so, which one? 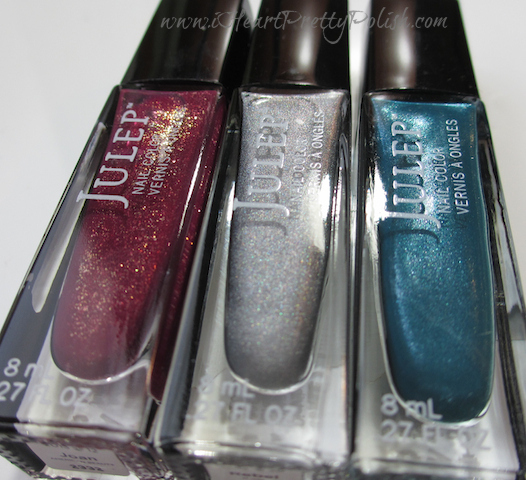 If you haven't tried Julep, feel free to use my referral link on the bottom of my page. You can get your first box for a penny and skip or cancel at any time. Email me if you have questions. I opted to skip this month in an effort to save money... but now I wish I didn't! Haha! I really want to try their Freedom top coat! :) It's hard to tell with just the pics of the polish. They need more swatches in order for us to make an informed decision whether or not we want to cancel. This might just be my favorite box to date. I love all of these shades and the eyelash curler was a nice surprise! Mine too. I really like all of the colors! I haven't tried it yet, but I am interested to see bow the tkpcoat works. Seems like the new tbing is the gel-like topcoat. I know I've seen a few advertised. Sorry for tbe typos. I'm terrible on my phone!!! No problem with the typos...I knew what you were saying:) I am excited to try to the top coat too! I loved all the colors this month! I went with my normal boho glam box but could have easily gotten them all. I can't wait to see what you do with these! Me too. It will be fun to try them. Yes, I am really impressed this month. Me too! I'll let you guys know. I'm sure you will get it soon. I try not to look at posts like this because I like the surprise in the mail! What fantastic polishes! I can't wait to see them! I can't wait to try them. Thanks for commenting!